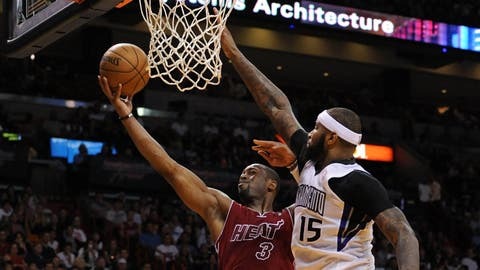 The Heat continue their road trip out west when they visiting the Sacramento Kings. What isn’t all that shocking is that the absence of Dwyane Wade played a role in half of those setbacks. The Heat (22-6) have gone 8-4 outside Miami, but the only loss that came against a top-tier team was a 90-84 defeat at Indiana on Dec. 10. The others have come to clubs which are all at least five games under .500 – Philadelphia, Brooklyn and Chicago. Whether Wade suits up in Sacramento remains to be seen. Resting the All-Star may seem logical given the matchup opens a back-to-back that concludes Saturday against Portland – one of the Western Conference’s top teams that is leading the league with 108.4 points per game. "We’re not better than we were last year, but it’s only December," James said. "I believe we can be better than the team that won in June. This is a process. We don’t want to play championship ball right now." "First of all, we didn’t get stops," said Isaiah Thomas, who had 21 points. "Secondly, we didn’t dial in on that end of the floor and (Evans) made every play. He scored, he passed, and he did what he wanted." DeMarcus Cousins had 24 points and 14 rebounds, but Rudy Gay struggled through a 2-for-12 night and scored 11 while committing six of the Kings’ 22 turnovers.